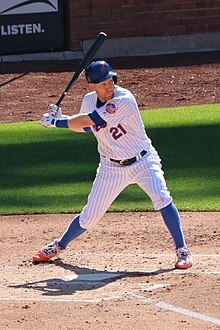 Todd Brian Frazier (born February 12, 1986), nicknamed The ToddFather and Flava Fraz, is an American professional baseball third baseman for the New York Mets of Major League Baseball (MLB). He previously played for the Cincinnati Reds, Chicago White Sox, and New York Yankees. Frazier is 6'3", 215 lbs, and right-handed. He played shortstop for the Rutgers Scarlet Knights in college. Frazier has also played first base. He was a member of the 1996 Junior Pee-Wee National Champions in football. He played high school baseball at Toms River High School South. He was drafted by the Colorado Rockies in the 37th round of the 2004 draft but did not sign. At the age of 12 and measuring 5 feet 2 inches (1.57 m) and 104 pounds (47 kg), Frazier was a star on the Toms River East American Little League All-Star team that won the New Jersey state championship and then the US East regional championship, to advance to the 1998 Little League World Series in Williamsport, Pennsylvania. Dubbed the "Beasts of the East" for their skill, power and lucky-charm, stuffed gorilla, the team went undefeated in the tournament, and Frazier saved his best performance for the world championship game against the Far East and International-champion Kashima Little League from Kashima, Ibaraki, Japan, on August 29 at Howard J. Lamade Stadium. Beginning the game at shortstop, not only did he go 4–4 with a leadoff home run, but he was also the winning pitcher and recorded the game-winning strikeout that sealed a 12–9 Toms River win and the world championship – the first American Little League world championship since 1993. On July 31, 2011, Frazier hit his first career home run, a solo shot off of Barry Zito's 1–1 hanging curveball. On May 16, 2012, Frazier hit two home runs against the New York Mets. On May 23, 2012, he hit a walk-off home run in the bottom of the ninth against the Atlanta Braves. On May 11, 2016, Frazier made an astounding play in the seats behind the third base line. In recoil, he suffered an apparent facial injury and left the game. Luckily, the injury was nothing serious, but it required 5 stitches by the lower lip. On July 11, 2016, Frazier placed second in the 2016 MLB Home Run Derby at Petco Park in San Diego, losing to Giancarlo Stanton 20 to 13 in the final round. Frazier's total of 42 home runs, and Stanton's total of 61 home runs in the 2016 Derby make them the top two hitters of all time in a single Derby. In his first full season in Chicago, Frazier finished with career highs in home runs, runs batted in and walks despite hitting a career low .225 in 158 games. In his second season through 81 games, Frazier hit 16 home runs with 44 RBIs while hitting .207. For the season, he had the lowest batting average on balls in play (.236) of all major league players, and had the highest fly ball percentage (48.7%) and the lowest line drive percentage (15.7%) of all major league hitters. Frazier signed a one-year, $12-million contract with the White Sox on January 13, 2017. On July 25, 2017, against his former team, the Cincinnati Reds, Frazier hit into a run-scoring triple play in his first home at-bat as a Yankee. Frazier hit his first home run as a Yankee on July 26 against the Reds. He finished the 2017 season hitting .213 with 26 home runs and 77 RBI with the White Sox and Yankees. 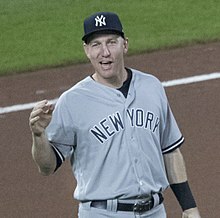 With the Yankees, Frazier developed into a fan favorite and played a key role in the clubhouse as the team's emotional leader during their postseason run. On February 7, 2018, Frazier signed a two-year, $16 million contract with the New York Mets. On May 3, 2018, Frazier claimed that umpires were doing a worse job of calling balls and strikes in 2018 than in previous seasons and asked for a meeting with MLB commissioner Rob Manfred to discuss his frustration. "It's rubbing everybody the wrong way," Frazier said. "You have to be better than that." MLB said it had no comment on Frazier's remarks. The Mets placed Frazier on the disabled list on May 8 after he suffered the first hamstring injury of his career. Frazier was activated from the disabled list on June 5 after appearing in three rehab games with the Triple-A Las Vegas 51s. He was placed on the disabled list on July 9 for the second time in the season with a rib cage injury. He finished the season hitting .213 for the second straight season with 18 home runs and 59 runs batted in. Frazier was placed on the disabled list to begin the 2019 season with a left oblique strain. On December 14, 2012, Frazier married his longtime girlfriend Jackie Verdon, a former Rutgers gymnast, who is also a New Jersey native. In March 2014, they had their first child, a son named Blake. Their daughter, Kylie Kimberly, was born in December 2015. He now lives in Toms River, where his name now graces the Little League field called Frazier Field House. The Frazier family has Scottish ancestry. Todd has two older brothers who also played professional baseball. Jeff Frazier played in nine major league games in 2010 for the Detroit Tigers and spent a total of nine seasons with the Detroit Tigers, Seattle Mariners, Washington Nationals and the Chicago White Sox organizations without returning to the Major Leagues. Charlie Frazier played for six seasons in the Florida Marlins organization. Frazier is a fan of fellow New Jerseyan Frank Sinatra, and often chooses Sinatra's songs to play when he walks up to the batter's box before an at-bat. ^ McGinty, Kate (July 14, 2015). "Why is Todd Frazier called the ToddFather?". Cincinnati.com. ^ "Toms River Football Team Headed To National Championships". Toms River, NJ Patch. November 27, 2015. Retrieved July 23, 2017. ^ 37th Round of the 2004 MLB June Amateur Draft. Baseball-Reference.com. ^ Kernan, Kevin. UP GOES FRAZIER! LITTLE LEAGUE HERO TURNED RUTGERS STAR COULD BE NEXT JETER Archived April 15, 2008, at the Wayback Machine, New York Post, June 3, 2007. Accessed June 11, 2007. ^ "Apparently Derek Jeter and Todd Frazier go way back". MLB.org. MLB Advanced Media, LP. Retrieved July 21, 2014. ^ "Frazier Named Rivals.com First Team All-American: Scarlet Knight Collects Another First Team All-America Honor" Archived April 16, 2008, at the Wayback Machine, Rutgers Scarlet Knights press release dated June 6, 2007. Accessed June 11, 2007. ^ MLB.com 2007 Draft Tracker, MLB.com Draft Tracker. Accessed June 8, 2007. ^ Rachac, Greg. Mustangs shake off recent slump in 9–3 win over Orem Archived September 12, 2012, at Archive.today, Billings Gazette, July 12, 2007. Accessed July 14, 2007. ^ Sheldon, Mark. "Reds place Cozart, Frazier on 40-man roster | reds.com". Cincinnati.reds.mlb.com. Retrieved July 14, 2015. ^ Danneman, Joe (May 23, 2011). "Struggling Volquez Sent to Minors". FOX19. Archived from the original on September 27, 2011. Retrieved May 23, 2011. ^ Johnson, Brent (May 23, 2011). "Todd Frazier, former Rutgers star, makes major-league debut". The Star-Ledger. Retrieved May 24, 2011. ^ Gleeman, Aaron (May 24, 2011). "That was quick: Reds send Todd Frazier back to Triple-A". NBC Sports. Retrieved May 24, 2011. ^ "Get a grip: Reds' Todd Frazier loses bat, still connects for home run (Video)". ^ Rosecranz, C. Trent (May 29, 2013). "Reds rookie Todd Frazier saves choking man in Pittsburgh". CBS Sports. ^ "frazier-named-players-choice-rookie-of-the-year | FOX Sports". Foxsportsohio.com. November 6, 2012. Retrieved July 14, 2015. ^ Rosecrans, C. Trent (April 18, 2013). "Todd Frazier's home run was a request by Ted Kremer". The Cincinnati Enquirer. Cincinnati.com. Archived from the original on June 26, 2013. Retrieved July 1, 2013. ^ Kevin Manahan. "N.J.'s Todd Frazier: From a little slugger to MLB's Home Run Derby". NJ.com. Retrieved July 14, 2015. ^ a b "Todd Frazier falls in HR Derby, but family wins". Cincinnati.com. July 15, 2014. Retrieved July 14, 2015. ^ "Todd Frazier Reaches Home Run Derby Finales, Falls to Defending Champion". Archived from the original on July 27, 2014. Retrieved July 21, 2014. ^ "Todd Frazier, Reds agree to deal". ESPN. Retrieved February 9, 2015. ^ Mello, Igor (April 21, 2015). "Reds 3B Todd Frazier comes up grand in win over Brewers". CBSSports.com. Retrieved April 23, 2015. ^ "Todd Frazier to serve as 2015 All-Star Game spokesperson". Cincinnati.com. May 12, 2015. Retrieved July 14, 2015. ^ Sheldon, Mark (July 13, 2015). "Deep goes Frazier! Reds star KOs Derby field". MLB.com. Retrieved July 14, 2015. ^ a b Shea, John (July 13, 2015). "Todd Frazier edges Joc Pederson in Home Run Derby". SF Gate. Retrieved July 15, 2015. ^ "Todd Frazier hurt as White Sox struggle late again in loss to Rangers". Comcast Sports Chicago. Retrieved May 11, 2016. ^ Kuty, Brendan (July 12, 2016). "2016 MLB Home Run Derby: Marlins' Giancarlo Stanton beats N.J.'s Todd Frazier". nj.com. Retrieved July 15, 2016. ^ Major League Leaderboards » 2015 » Batters » Batted Ball Statistics | FanGraphs Baseball. Fangraphs.com. Retrieved on December 22, 2018. ^ Major League Leaderboards » 2016 » Batters » Advanced Statistics | FanGraphs Baseball. Fangraphs.com. Retrieved on December 22, 2018. ^ "Todd Frazier hopes to talk to Paul O'Neill about wearing No. 21". NY Daily News. Retrieved July 19, 2017. ^ III, George A. King (July 21, 2017). "The Yankees won't let Todd Frazier wear number he wants". New York Post. Retrieved July 23, 2017. ^ "Todd Frazier plays first Yankees home game". Major League Baseball. Retrieved July 29, 2017. ^ "Todd Frazier celebrates first Yankee home run after tough start". NY Daily News. Retrieved July 28, 2017. ^ DiComo, Anthony (February 7, 2018). "Mets sign Todd Frazier to 2-year deal". MLB.com. 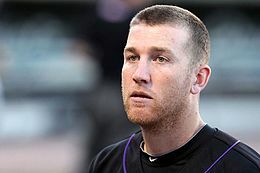 ^ "Salty Frazier wants to meet commish over strikes". ESPN.com. Retrieved May 4, 2018. ^ Puma, Mike (May 8, 2018). "Mets turn to platoon for offense as Todd Frazier hits DL". New York Post. Retrieved May 10, 2018. ^ "Todd Frazier, Anthony Swarzak rejoin Mets". MLB.com. Major League Baseball. June 5, 2018. Retrieved June 5, 2018. ^ New York Mets place 3B Todd Frazier on DL with left rib cage strain. Espn.com (July 9, 2018). Retrieved on 2018-12-22. ^ Hurm, Nick (December 15, 2012). "Todd Frazier gets married". Archived from the original on October 19, 2013. Retrieved July 14, 2014. ^ Zahneis, Meggie. (July 18, 2014) Meggie Zahneis: Fatherhood suits Reds third baseman Todd Frazier just fine | MLB.com: News. Web.archive.org. Retrieved on 2018-12-22. ^ "Instagram photo by Jackie Frazier • Dec 18, 2015 at 3:21pm UTC". ^ Ramsey, Jamie (November 30, 2012). "Frazier's Hurricane Sandy Relief Efforts". MLB.com. Retrieved July 14, 2015. ^ "Jeff Frazier Statistics and History". Baseball-Reference.com. Retrieved July 14, 2015. ^ "Jeff Frazier Minor League Statistics & History". Baseball-Reference.com. August 10, 1982. Retrieved July 14, 2015. ^ "Charlie Frazier Minor League Statistics & History". Baseball-Reference.com. July 6, 1980. Retrieved July 14, 2015. ^ "A tale of Todd Frazier, his grandparents and Frank Sinatra | MLB.com: News". Mlb.mlb.com. Retrieved July 14, 2015. 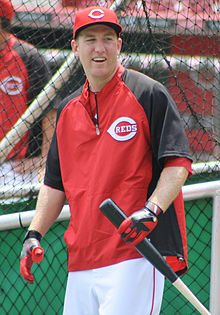 Wikimedia Commons has media related to Todd Frazier.